If you don't see the music player below, visit macromedia.com to download Flash. The 12th Street Rag was composed in 1914 by Euday L. Bowman, a Ft. Worth, Texas native who was earning his living in Kansas City at that time. 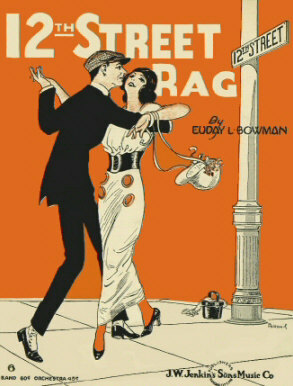 Bowman also composed the 11th Street Rag and the Petticoat Lane Rag, also named for streets in Kansas City. Bowman sold the rights to the 12th Street Rag to the Jenkins Music company for $100. The song you'll hear playing below was recorded in 1921 by the Imperial Marimba Band. You need to have Macromedia Flash installed to listen to this sample. Visit www.macromedia.com to download. This is a low-quality flash stream, optimized for faster downloading. To download a higher quality MP3 version of this song, click here. To save the MP3 to your computer, right click here and select, "Save Target As..."